Looking for the perfect literary gift for the book geek or writer in your life this Christmas? There’s still plenty of time to shop before Christmas arrives. I’ve included five items for readers and five for writers in this literary gift guide. They’re all items that I use myself or items I plan to buy for myself sometime soon. I have exactly 0% advertising on my website so you can be sure my recommendations are completely objective. Got a book nerd to buy for but have no idea what they’ve already read? This Binge-Reading Kit is a super cute and fun item to get for readers this Christmas. It comes with 14 items in the kit that are helpful for any serious readers; bookmarks, ear plugs, a reading light, and a bunch of other things! And it’s only $20! I have wanted these for such a long time, but unfortunately I can’t install shelving in my apartment. Someday I’ll get my hands on these. Not only are they great for storage purposes, but the floating book aesthetic is just really cool. As a kid, I dreamed of inventing this item to make reading in the bath easier. Probably it already existed and I hadn’t even realized it. With an over tub caddy you can keep your book dry, keep a beverage close at hand, and with this one you can even add a candle! Perfect for book lovers who love baths. This is just Cards Against Humanity for book geeks. This is perfect for the book nerd who has other book nerd friends! I’ve not played it, but I am high key interested in it. Besides, I could use a break from Cards Against Humanity. I bought a Sherlock Holmes scarf as a treat for myself years ago and I pull it out to wear every winter. Granted, it isn’t the warmest scarf out there, but it’s very cute and I get tons of compliments on it. This is a fun literary take on a classic Christmas gift. If you take writing seriously, then you absolutely need to own this book. In this book writers will find materials dedicated to the publishing process and marketing advice, listings of book publishers, query letter examples, lists of professional writing organizations, and much more. I’d recommend this book for any writer who looks to pursue publication within the next one to two years. 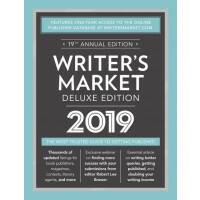 With the deluxe version writers will also get a one year subscription to writersmarket.com. This single book is an invaluable resource. A one year subscription gives you 8 issues, each one filled with writing tips, author interviews, and tons more. This is another great way to give the writer in your life tons of advice about their craft, publishing, and marketing, and it’s a gift that literally keeps on giving all year. My best friend bought me this for Christmas last year and it is tons of fun. The games and exercises in this toolbox can help generate new ideas or simply help you past a roadblock. Or, if you’re just looking to do some free writing, it is great for helping you experiment! This is a more expensive gift, but one your writer friend will love. A conference is a great place to network, attend sessions and workshops, get critiques, and meet new and established authors. A retreat allows writers to spends days to weeks focusing on nothing but their writing. You’ll have to do some research to see which one works best for your writer. Writers may write at home, at coffee shops, or anywhere that has an internet connection. Sometimes the ambient noise is nice, but sometimes it is too distracting. A good pair of headphones, especially noise cancelling headphones, can do wonders. I’m linking to the pair I use, which block out most sound and have great sound quality. I also wrote a holiday book gift guide last year if you want to pick out a book instead! Merry Christmas and Happy Holidays, everyone!